Wrong Maths to Fool Investors! On May 6, 2014 Times of India had published an analysis stating “ONLY BUILDERS, BANKS GAIN WHEN YOU TAKE LOAN TO INVEST IN REALTY” and showed that investing in fixed deposit and recurring deposit is more beneficial than investing in real estate. This article was shared a lot many times on social media. I personally did not believe the calculations and so here is my take on how the calculation that was shown to readers was flawed. The calculation is reproduced below with my comments. As you can see while calculating returns for real estate investment there is deduction of Rs 13 Lakhs as upfront payment & stamp duty. In reality the upfront payment made initially comes back to investor and so it should not be deducted. Only the stamp duty of Rs 3 lakhs should be deducted. This makes the net returns on real estate higher by Rs 10 lakhs at Rs 47.59 lakhs which is higher than Rs 44.41 lakhs as made by investing in FD/RD. The above example has lot of components and hence might be difficult to comprehend. So taking the same assumptions I did a calculation where one investor buys real estate without loan and while the other investor invests all amounts in Fixed Deposit. I hope the above calculations would have cleared any confusion. You cannot trust everything that is on newspapers! Even excel sheets and math can be used to fool investors. The above calculation is not to prove that Real Estate is a better investment as the assumptions above may not hold true always. To calculate time value of money you just discount the numbers at end of 5 years. Since the discount percentage would be same across all numbers, the results would not change! Amit I brought a property breaking FD’s at 10.75% in 2012 that property was only good in location . I just came in lure to buy that property and convinced my elders to invest .75 cr of all we had at that time that too in white to that property. then came another era. the rates of property fallen when property taxes came in market and the property is still there but I am pennyless. it will take me another 20 years to be at place. properties are for those with good in their birth chart (mars) even property yoga is just giving tension. please be aware to buy property you say you will sell later. What if you will not have any buyer thence???? There is nothing called best investment option. Remember its personal finance and so the “Best” option depends on the person to person. It can vary based on your income, assets, age, risk taking ability, the support system you have among many others! Historically stocks, equity based mutual funds have given high returns in long periods of time and fixed income like Fixed deposit and debt mutual fund are suited for short term. Totally agree Saurabh. The point in this post was just to show the flaw in calculation and how this might be prevalent in lot of financial product illustrations and comparisons. Here I would like to add that when you invest in real estate or flat you should also consider Yearly property tax + Yearly Maintenance of the flat. And here i would like to say that valuation of the property becomes stagnent at some point of time while INterest on FDs will be never ending. When you calculate it for Five years the author might be right but over a longer period of time FDs are best according to my view. I agree to all your points..we need to consider maintenance costs and yearly taxes on real estate…after considering all these, RD/FDs still appears the best option when we compare it with real estate investment by taking a loan. But with full cash investment in real estate option, real estate will be a good option..but we need to consider current rate of appreciation and further scope of appreciation for the area….FD/RDs provide best returns when kept for long due to its computing feature.. Yes it depends on all the assumptions you make for an investment. The assumptions might hold or might not hold true. But the post was to prove that we cannot blindly trust newspapers! How can you deduct the prinicpal from the calculation for FD / RD ??? At the end of the term you are getting principal plus interest. In case of property, are you getting back the 10 lacs you have paid to the builder as down payment that it should be added to the final amount ??? Yes Kevin even when you sell your property you get your principal back. The profits are similar to interest received on FD. I understand this confusion with a lot of people and hence it was in the newspaper – even though the calculation was fundamentally flawed! Amit! Bang on. The return calculation for FD should consider 13L as outflow as well, which will show the total return to about 31,41,919, which is worse than 37,57.979 of Real estate. Of course, here FD is perhaps the most unproductive investment option, though safe. So any other avenue, which provides better return than FD, but much less riskier than Real Estate, should make this analysis interesting. ToI calculation is perfect but not saying that their assumptions are right. 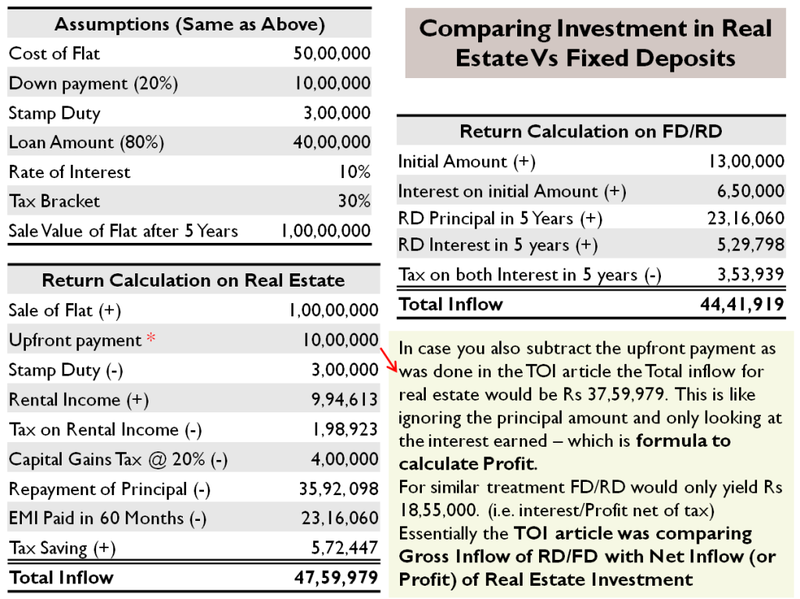 The TOI calculation compares Gross return of FD with Net returns of Real estate. Your formula is right for Net inflows but TOI has not used this. If you deduct the FD principal the returns would be much lower as compared to RE. ToI is not an investment expert. I think those who read it do not go by what it advises. It is not just calculations many of the assumptions are not valid that people will notice for sure. 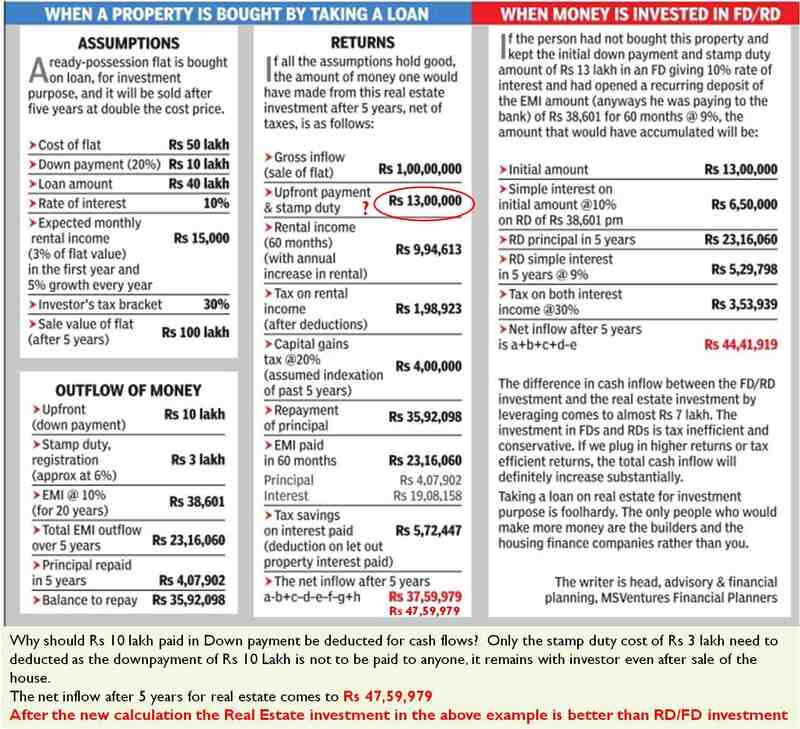 Yes TOI is not investment expert but the author of the calculation is a Financial Planner! Unfortunately its not true that it does not influence investors. I saw people sharing this on lot of social network with comments in approval and this was the reason which made me post this. 3. ‘No loan’ analysis: having 50 lakhs in my pocket and buying a house (and selling it for double in 5 years) will obviously give me better returns compared to taking a loan of 40 lakhs.. Also this doesn’t poke a hole in the original analysis, because you are doing a different analysis..
@ Balu thanks for reading and commenting. Not everyone pays attention to details. Here are my explanations to your points. 1. Down payment is definitely a cash flow and so is the amount deposited in bank for FD. So if you deduct the initial payment for buying house you need to deduct the same from FD calculation. So in case of TOI calculation for FD, you might want to deduct Rs 10 Lakhs which will leave you with Rs 34 Lakhs, which becomes lower than return on Flat. 2. I agree with the intent of the article but then you cannot manipulate components in the calculation to prove your point. 3. Yes the “No Loan” analysis is different analysis but conceptually same. The components do not change even for this, except that the EMI & Loan becomes 0. You just need to plug-in loan/EMI values in the template and you get the answers. 4. Upfront Payment should not be used because I am looking at total amount that is left with me after I sell my house or the amount I have after FD maturity. It’s mainly to do with what am I looking at Total Amount (Principal + Interest) or Interest alone. 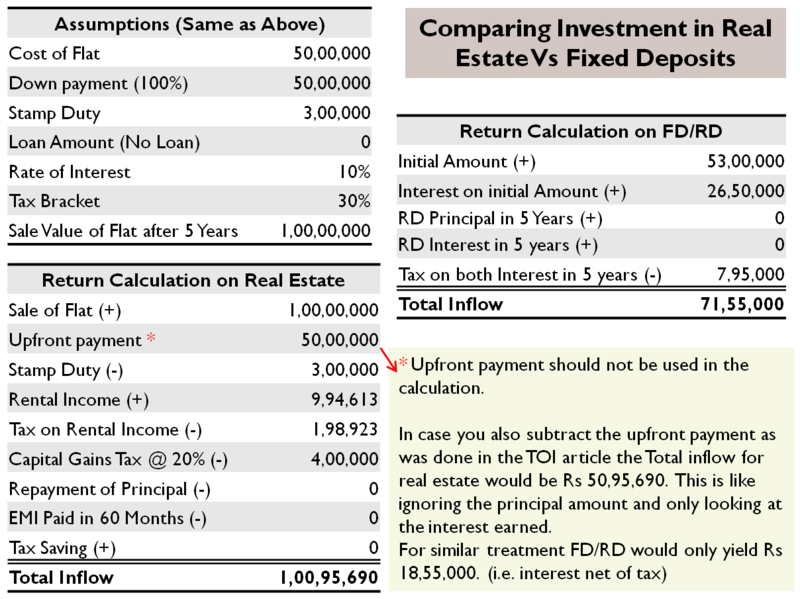 The TOI calculation is comparing Total Amount generated by investing in FD/RD with only the interest (return) component of Real Estate. This is the catch. Also as an investor I am worried only at the total amount that is left with me after my investment matures or after I sell my house. And with above assumptions Real Estate Investment is a winner, whichever way you look at it. Look forward to your suggestions!